The Drop History report, located in the Families/Students and Classes/Enrollments sections of the Reports menu, is used to find students who have been dropped from classes. By default the report excludes drops resulting from a transfer and drops on or after the end of class (class completed), however, you can use the search criteria to report on those drops. When you archive a class, the enrolled students are dropped with a reason of Class Archived and it is noted that the student completed the class (Comp? = Yes). 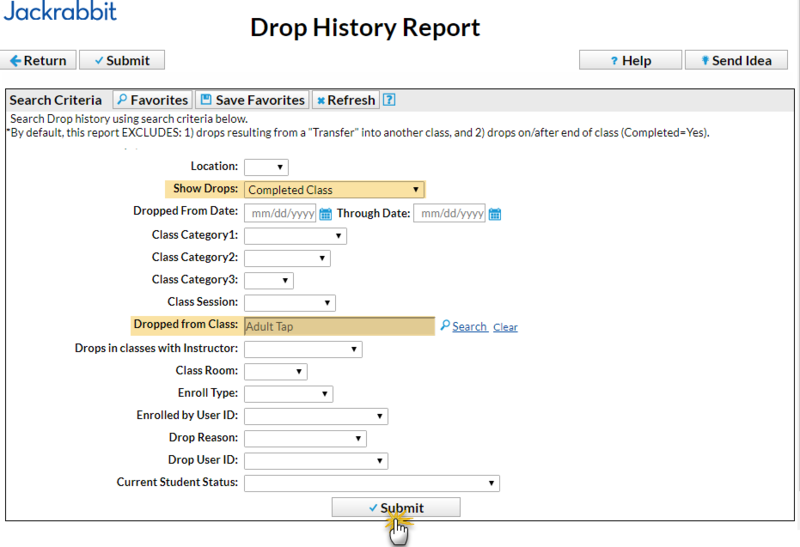 The Drop History report search criteria Show Drops = Completed Class allows you to pull students who were dropped from classes during the archive process (not transfers or true drops). Search for the specific archived class using the Dropped from Class criteria. In the class search window use the Status drop-down to filter for only Archived classes. In the resulting report you can select all, or only some, of the students that were in that class and send them an email. A history of this email is retained in the Family record, on the Misc tab > View Sent Emails. Alternatively, you can restore the archived class and then use the Email Class button to send an email to all students that were enrolled at the time the class was archived. You will need to re-archive the class when you are finished with the email.